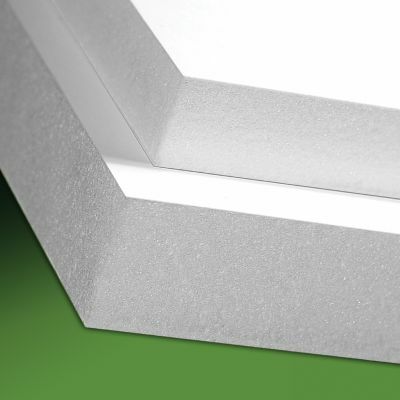 Gatorfoam Exterior offers all of the features of Gatorfoam, the industry’s leading heavy-duty foam board for more than 30 years. Gatorfoam consists of polystyrene foam bonded between two layers of wood-fiber veneer laminate. This unique construction makes Gatorfoam rigid yet lightweight and warp-resistant; its surface also is exceptionally smooth and strong, offering superior dent- and scratch-resistance. To enhance its weather performance, Gatorfoam Exterior is manufactured with a specially formulated adhesive that improves both bond strength and moisture resistance. This adhesive reduces the chance of delamination when Gatorfoam Exterior is exposed to outdoor conditions, including heat, cold and humidity. Gatorfoam Exterior has been tested according to ASTM D1183 C in temperatures ranging from minus 70 degrees to 160 degrees Fahrenheit and in the combination of high heat and humidity (100 F with 95 percent relative humidity). This glue formulation has been improved even further over 3A Composites’ original offering of Gatorfoam Exterior earlier this year. The enhanced adhesive does not now “yellow” over time. Gatorfoam Exterior is the ideal substrate for exterior signs and displays with mid-term lifespans. It may be decorated with both direct digital printing and screen-printing operations as well as painted. It is recommended that the exposed edges of Gatorfoam Exterior be sealed with a non-solvent paint or primer; the substrate core should not be exposed to solvent-based paints. Gatorfoam Exterior may be either saw cut or routed.